My living room poses a bit of a layout challenge. After arranging and re-arranging the seating area at least a half-dozen Type A times, I finally decided that what's missing is a focal point. Something to draw the eye in. I decided that what I needed was a tall, faux fireplace mantle. Here are my top five tips to style a fireplace mantle. I recently acquired a vintage fireplace mantle from one of my favourite local antique and salvage shops. The store is aptly named The Salvage Shop. You see, my living room poses a bit of a layout challenge; it's open-concept in the truest sense and shares space with my dining room. It's a big, open square with odd-sized windows to boot. Not the prettiest of spaces, but as a firm believer that every room can be transformed into a cohesive and beautiful space, I set out with that vision in mind. After arranging and re-arranging the seating area at least a half-dozen Type A times, I finally decided that what's missing is a focal point. Something to draw the eye in. I didn't go the armoire route because we have built-in cabinets in our family room and didn't need to create more storage space. But I decided that what I needed was a tall, faux fireplace mantle. The kind that conjures images of cozy fireside gatherings with friends with the snow falling outside. Except faux, so forget the actual fire part of that image. Luckily, Roy -- who owns The Salvage Shop -- got my imagery. The new mantel is 47 inches high by about 70 inches wide and fits nicely with our eclectic, transitional-style living room. Whether you have a working or faux fireplace mantle, you owe it to your inner designer to fluff the heck out of it. 1. Curate the space: start by carefully deciding what you want to display. It's visually appealing if you include an odd number of pieces and anchor both sides of the mantle with the heavier items. For instance, framed photos are always nice if they're flanked by taller items, or layered in different sized frames. Edit, edit and then edit again; don't be afraid to try dozens of combinations. 2. Stand proud: the mantle is prime real estate as the focal point of a room. 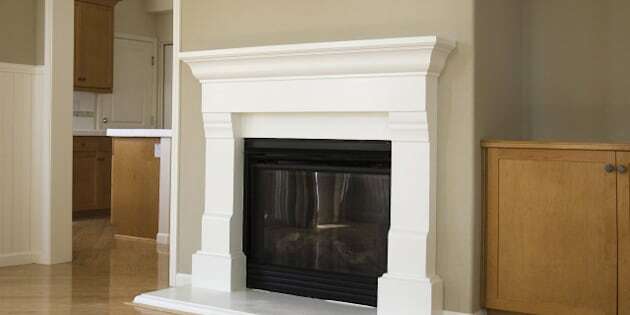 There are many ways to style a mantle depending on your personal taste. Symmetry may be really important to you and means that you should flank both sides of the mantel with tall, identical objects like topiaries or candlesticks. Perhaps you have a more minimal approach and a few carefully layered pieces are all you need. Decide what speaks to you and have fun playing with height, artwork and texture. Display what you love. 3. Shake it up: create some movement by including items of various heights to draw the eye in and up. This can be as simple as staggering a few vases with wildflowers or vases of various heights. 4. Pop that colour: adding a favourite piece of artwork above your mantel is a sure way to highlight it. It's also a great way to infuse colour into a space. Don't worry about it being matchy-matchy; sometimes an eclectic mix of things works best. 5. Be a clever collector: a mantle is a great place to display a collection. Just be sure that you include some varying sizes or slight height differences to keep it interesting and grab attention.